The expectation of a scandal at the NATO summit was in the air, and it occurred before the beginning of his work. Before a working breakfast with NATO Secretary General Jens Stoltenberg, Trump attacked the Russian-European Nord Stream-2 project, accusing Germany of being "completely controlled" and taken hostage by Russia, which will supply Germany with about 70% of the consumed her natural gas. And already during the breakfast itself, so that no one thought that he had made a reservation, Trump said that he considered it unacceptable to build a gas pipeline. The US President suggested that the NATO Secretary General jointly think about what can be done about it. Disturbed by this tirade, Stoltenberg, with whom Trump kept himself as a host with a waiter at the NATO table, could only mumble that the future of Nord Stream 2 is not within the competence of NATO, since this is the "national question" of Germany and other participants in this project. 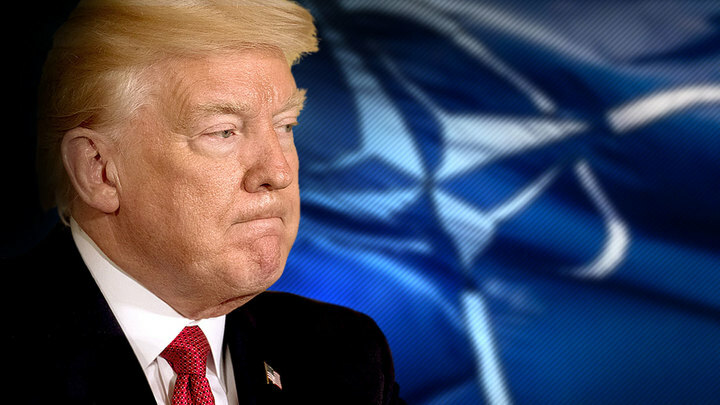 So immediately came the predictions of politicians and experts about the fact that the planned NATO summit in Brussels on July 11-12 will not be routine, despite a preliminarily agreed agenda, thanks to the participation of Trump in it. The owner of the White House recalled his signature under the final "joint" declaration of the G-7 summit in Quebec, leaving it with a scandal ahead of time in Singapore to meet with his dearest heart the North Korean "dictator" Kim Jong-no. And then Trump will travel from Brussels to Britain to Prime Minister Teresa May and Queen Elizabeth II, and from there she will travel to Finland for a long-awaited meeting with Russian President Vladimir Putin. As we see, he again can not deny himself the pleasure of merrily mocking his vassals, this time NATO. All repeats. The fact that the new scandal is inevitable was also evidenced by the "art preparation" on Twitter that Trump gave before the "landing" in Europe and the verbal response of the EU leadership to it and the behavior of the Belgian authorities, the hosts of the NATO summit. Trump was not original, once again criticizing the European members of NATO for the fact that most of them are not spending enough on defense, allegedly receiving more from the alliance than the United States. He argued that the Europeans "owed" the Americans for their "protection" a huge amount of money, which would not hurt to "repay", including the purchase of American weapons. Thus, the atmosphere of the scandal was already in the air when the Trump plane landed in Brussels. Further more. Nobody met the leader of the Western world at the airport. The Belgian leaders showed their contempt for Trump on the pretext that they watched the semi-final match of the World Cup and were rooting for their national football team. After such a "warm" meeting, Trump, convinced that the European vassals of the US use them as a "pig-piggy bank," saving themselves on defense spending, was in a mood to make a scandal. The only way for Europeans to stop, according to Trump, this "dishonest and unacceptable" behavior is to buy more weapons from the US, which some particularly helpful vassals do. So, on the eve of the NATO summit, the US State Department approved the sale of aviation missiles to Britain and Denmark for a total of $ 740 million. Washington makes a special calculation for Germany, which really wasn't developing its armed forces in recent decades, but is now at one of the first places in the EU to increase defense spending. The Germans can enrich the US military-industrial complex by billions of dollars. Trump "smells" this money and wants to provide them as soon as possible. Because, despite the growth of military spending, directed mainly against Russia, the EU countries do not become stronger at the same time. There is no real threat from Moscow. But the military-technical dependence on the United States is growing and the readiness of their military contingents to play the role of Washington's assistants in the implementation of its global policy. Although all its benefits go to the Americans, and the accompanying costs, for example, in the form of migrants from the countries destroyed by the United States get to Europeans. The official agenda of the summit and the stay of the American president is known and does not promise any surprises by itself. As US Permanent Representative to NATO Kay Bailey Hutchison said, Trump will meet separately with NATO Secretary General Stoltenberg. The emphasis on the alliance's activities is made on the distribution of the financial burden and on the problem of containing Russia. In addition to the propaganda rattling on the theme that Russia is evil, and NATO members are so white and fluffy, Brussels is also planning a topic about the future acceptance of Georgia and Ukraine into the alliance. Illusions of Kiev and Tbilisi on this account are persistently supported as one of the means of pressure on Russia. And, finally, the summit participants will "unanimously approve" a number of coordinated measures to increase the effectiveness of the alliance's activities. This is a new NATO command structure, which provides for the formation of two new headquarters in the US and Germany, the initiative "4x30" (30 land battalions, 30 air squadrons and 30 warships until 2020 should be ready for use within 30 days or less). NATO will also approve the creation of support operations teams, the expansion of participation in the operation in Afghanistan and the training of the Iraqi army. It is clear that the alliance members have already agreed on all these issues. However, they are still afraid - and for good reason - that Trump can throw something out, especially at the upcoming meeting in Helsinki with Putin that the "unity" of the alliance will still be in jeopardy. After all, the owner of the White House continues to reproach NATO members for "unfair" treatment of the United States, promising to "come up with something" in order to change this.